At Advanced Custom Cabinets and Closets, we specialize in a wide variety of storage solutions and are top rated for in quality, service, and pricing. We offer much more than your average closet organizer. Each and every one of our units is custom designed from the ground up and tailored to fit your space and your needs – and not just closets, either. In addition to custom closet design, we can also help you organize and beautify your garage, pantry, laundry room, and much more. If you've got clutter or inefficient shelving or cabinetry, we can help you find a storage solution for almost every room in your home. We hope you can find everything you need, here. Advanced Custom Cabinets and Closets is focused on providing high-quality service and customer satisfaction. We will do everything we can to meet our customers expectations. With a variety of offerings to choose from, we are sure you will be happy working with us. *ORG Home Authorized Dealer* We are New Jersey’s premier custom closet and storage solution company, offering full-service design and installation of custom closets, pantries, laundries, garages and more all over New Jersey including Atlantic, Bergen, Burlington, Camden, Cape May, Essex, Hudson, Hunterdon, Mercer, Morris, Monmouth, Middlesex, Ocean, Passaic, Somerset, Union and Warren Counties. Between Contemporary Closets and EncoreGarage of New Jersey, we have everything you need to design and organize your home and garage. 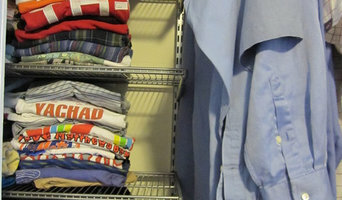 Please visit our websites to learn more about our customized solutions for every room: www.EncoreGarageNJ.com www.ContemporaryClosets.com At Contemporary Closets and EncoreGarage of New Jersey we pride ourselves on both innovation and experience when it comes to residential garage enhancement. For over a decade, we have been helping our customers transform their garage space from a state of disarray into clean, organized space. We have set the standard in NJ for flooring, cabinets, and organization with quality products and exceptional service. With an emphasis on aesthetics as well as function, we pride ourselves on delivering a beautiful end result that fits each customers needs, style and budget. We offer near-endless choices to create your ultimate space…one that is organized and beautiful. Choose from custom closet design, home office organization, signature garage cabinets, epoxy and polyaspartic polymer garage flooring, laundry, pantry, and even murphy bed designs. We also offer durable wall storage accessories. Contemporary Closets and EncoreGarage of New Jersey believes in hiring quality people, using quality products, performing at an exceptionally high professional level that differentiates us from other contractors. It sounds too simple – but it sure makes for happy customers! We only use products that are designed to meet the specific challenges of home garages as well as light commercial and manufacturing environments. We purchase the highest quality products from the most reputable companies in the country. We have up-to-date technical assistance as well as the latest equipment advances and installation techniques. We have knowledgeable, experienced people to ensure quality work and provide superior customer service for our clients. We pride ourselves in undertaking projects that start and finish as contracted. We help Connecticut homeowners transform everyday frustration into joy. Our custom pull‐out shelves bring you more space and access—making your life organized. ShelfGenie is a national franchise that provides homeowners with organizational Solutions, like Glide-Out™ shelves. Our Solutions bring more space, access, and organization to clients’ homes across the U.S. and Canada. Each of our Solutions are custom made and handcrafted to find our clients’ existing cabinets. This allows our clients to transform their space without having to get a renovation. Our Solutions make each of our clients’ lives easier, and help them to truly love their space. 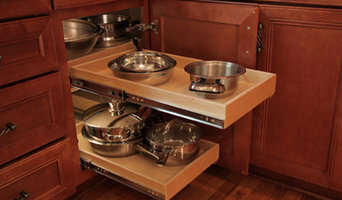 Easier access, more visibility, better organization - transform your existing cabinets and closets. CLOSET ENGINEERS is a family owned custom closet business serving the Tri-State area for 60 years. We are dedicated to providing the finest product at the lowest price while still maintaining personal customer service. Every system we sell is designed by a company owner, and installed by our expert team. We ensure that you will receive the full benefit of our many years in business. CLOSET ENGINEERS designs our closets, storage and office systems utilizing 3/4 inch high density melamine - available in 15 different finishes. Each vertical panel and shelf is custom cut to our specifications, ensuring a perfect fit every time. Our standard 2MM front edge banding prevents dents and chips, and has a lifetime guarantee. Drawer faces and doors are available in either flat or raised panel, and are supplied with your choice of hardware. CLOSET ENGINEERS also carries a full line of closet accessories to keep your ties, belts and other items organized and within reach. In addition, specific storage racks can keep all your sporting equipment and other garage items conveniently stored and organized. Century Closets is a NYC custom closets company specializing in developing custom closet solutions. As a certified New York City closet contractor we are able to service the entire tristate area, leaving you with confidence that you know you are working with a reputable contractor able to get the job done. Many homeowners face a problem when trying to design their ideal living space. Not all homes are created equally, and Century Closets understands that every family has different needs, No matter if customers need a wall closet system, pantry shelving, or office closets, they will be able to get help with design from a professional closet company in New York. More Functionality: Custom ShelvingCustom Closets NYC custom closets Customers can benefit from free design advice, and all the shelves and units are made to measure. This allows homeowners to make the most out of the given space and increase storage space without making the home look crowded. Everyone would store different items in closets and shelves, therefore, customers can adjust the organization features of their closet to their needs. This is one of the main benefits of having made to measure custom closets. Customers can even have their pantry shelving and wall closet system ordered to measure, saving space, and making their home more functional. Custom closets designed to fit your space. We are a custom closet and custom cabinetry company since 2005 we do custom closets, pantries, laundries, small kitchens, book cases, office furniture, wall units, and more.